Janet Disney Travel Agent Etobicoke Ontario - Travel Agents Specializing in Disney Vacations Canada. Authorized Disney Vacation Planners ClickTheMouse.ca, A Magical Vacation Is A Click Away! Dalmations!....no.....Janet has One Hundred and One plus trips to "The World" (Walt Disney World as the rest of us call it), five visits to "The Land" (Disneyland) and thirteen voyages sailed on the Disney Cruise Line. This ultimate Disney lover has also been to EuroDisney! (now known as Disneyland Paris). Her knowledge and passion for Disney is measurable. She also has a thing for male Disney Villains as you can see! 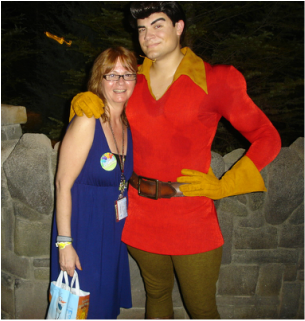 Janet knows the 'ins and outs' of travelling to Disney and even shares her secret unknown tips with seasoned Disney vacationers. If you have been to Disney already and want to take your vacation to the next level, Janet is the clickthemouse cast member you need to speak with! Favourite Snacks - Popcorn from the cart on the right hand side whilst facing the castle / Dole Whip / Emu, I mean Turkey Legs! Favourite Parade - Electric Light / Boo to You! ...you can see a theme here!